For the involvement and improvement requirement, you could, for example, dance, take part in a show, be a member of a band, or be part of a show. 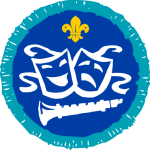 Phoenix Explorer Scouts regularly take part in the Basingstoke Gang Show which fulfils the requirements of the Performing Arts Activity Badge. Explorer Scouts should inform their Explorer Scout Leader if they are part of the Basingstoke Gang Show. Where applicable, badge requirements may be adapted or altered according to the abilities of a young person. Scout Association rules for adjustment can be found in the Policy and Approach article at the Scout Association website.